I have spent my professional life to advocating for the profession. Through my work while serving as the first Teacher in Residence at the USED to my participation in the development of the Model Standards for Teacher Leadership, to current work in supporting National Board candidates and developing teacher leaders, I constantly work to grow teacher leaders. share the knowledge, experience, and insight of teachers with policymakers and others. AT CTL, we prepare veteran teachers to lead from the classroom through providing high-quality professional development for them to be mentors and coaches to beginning teachers and Clinical Faculty who work with VCU pre-service teachers. Terry Dozier, the 1985 National and SC State Teacher of the Year, has a storied career in education advocacy. 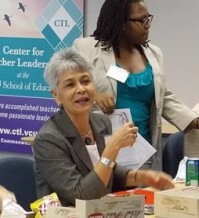 In addition to her current position in leading the training of teacher leaders at VCU, Terry served as the first Teacher in Residence at the US Education Department, under Secretary Richard Riley; directs the Richmond Teacher Residency Program; and served as a classroom teacher in diverse settings including Miami, FL, SC, and Singapore. Dozier holds an Ed.D in Curriculum and Instruction from the University of South Carolina.